With school coming to a close on May 24 students, teachers and even parents are looking for a way to unwind. Cowabunga Bay has you covered. 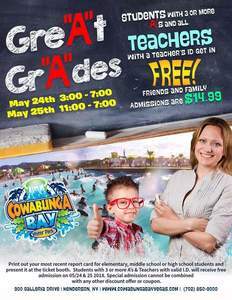 Cowabunga Bay waterpark, located at 900 Galleria Drive in Henderson, is offering free entrance on May 24 and 25 for students with great grades and all teacher. Students with 3 or more A’s on their final report card will receive free admission on those days. All family and friends get in for $14.99 on these dates. Don't forget that every Tuesday this summer is Cowabunga Bay's $22.22 for Tuesdays promotion. Admission is only $22.22 and they'll serve $2 Pizza Slices, $2 Soft Drinks, and $2 ICEE’s.